Q. Where are the Doctors in all this? We saw Ace and Sarah Jane, but how did the 1999 attack affect the young lives of Rose Tyler, Martha Jones, and Donna Noble? How many vampires and ghouls did Captain Jack Harkness get to take out in Cardiff? This is a continuity where the Doctor rarely visits Earth, having chosen some other planet as his pet favorite. 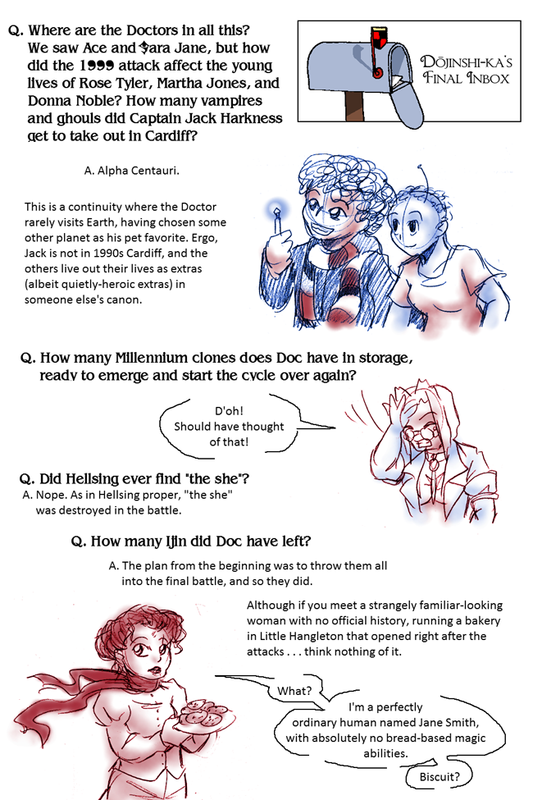 Ergo, Jack is not in 1990’s Cardiff, and the others live out their lives as extras (albeit quietly-heroic extras) in someone else’s canon. Q. How many Millennium clones does Doc have in storage, ready to emerge and start the cycle over again? Doc: D’oh! Should have thought of that! Q. Did Hellsing ever find “the she”? A. Nope. As in Hellsing proper, “the she” was destroyed in the battle. Q. How many I-jin did Doc have left? A. The plan from the beginning was to throw them all into the final battle, and so they did. Although if you meet a strangely familiar-looking woman with no official history, running a bakery in Little Hangleton that opened right after the attacks…think nothing of it. Mina Jane: What? I’m a perfectly ordinary human named Jane Smith, with absolutely no bread-based magical abilities. Biscuit?